UTBM is committed to the development of strong and sustainable relations with its partner universities all around the world. Sharing knowledge and promoting higher education within an international perspective is one of UTBM’s priorities. Therefore, UTBM takes part in various European and non-European exchange and research programmes to facilitate student and faculty mobility, to give international students and teaching staff the opportunity to visit our University and to participate in the sharing and development of higher education. Erasmus+ is a European mobility program seeking to encourage higher education cooperation and giving the possibility to thousands of students to discover other cultures and benefit from a richer and more diverse choice of courses. Before leaving to study abroad, students must have acquired a certain number of ECTS credits depending on the level they would like to join. BCI or the Conference of Rectors and Principals of Québec Universities offers a partnership with several different European Universities, in order to consolidate ties between the French speaking shores of the Atlantic Ocean. To further and strengthen its Canadian relations, UTBM focuses on establishing bilateral agreements with some of the universities involved in BCI. FITEC is a series of international exchange partnerships between French Engineering schools and South American universities. Currently, UTBM collaborates with UTC and UTT on two different programs: Arfitec, for exchanges with Argentina, and Brafitec for exchanges with Brazil. These programs finance student, teacher and researcher mobility through a system of scholarships. Eiffel is an excellence scholarship program created by the French Foreign Affairs department. 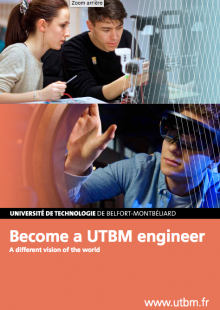 Eiffel scholarships allow international students (non French) among the best in their year to come to UTBM to study for a Degree (Engineering, Master or PhD). UTBM has welcomed 7 Eiffel students since 2006. UTBM has, for many years, developed partnerships around the world to present various opportunities to its students. Based on its international partnerships network, students can study for a semester abroad or work as an intern in a partner laboratory. The possibilities are numerous. Some collaborations transcend the simple exchange programs, and lead to dual award Engineering degrees or PhDs.